WE’RE now getting a better deal on new bikes next to our European neighbours, according to the latest survey of prices. 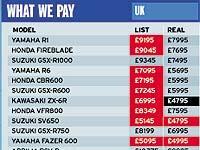 MCN examined the real prices you are likely to pay for 15 different models – and in many cases the UK is the cheapest. Our findings are in stark contrast to two years ago, when we did the same survey. Those depressing results showed that we paid more for every model. Now, though, the average price across Europe of MCN’s Machine of the Year – Suzuki’s GSX-R1000 – is £400 more than you’d pay in the UK. Only Germany is cheaper. Britain is the best place to buy Kawasaki’s top-selling ZX-6R, which is £1000 less here than in France and £500 less than in Italy, Germany or Belgium. And outside Italy you won’t find a better deal on Aprilia’s RSV-R Mille. The Spanish and the Dutch have to fork out a grand more than we do here for the V-twin. It’s now easier to compare list prices in the EU, thanks to the introduction of the Euro. This has removed differences caused by currency movements. So, for the first time, we’ve compared not just the list prices, but also the prices you can actually expect to pay in the dealers, based on quotes from stores and the lowest advertised prices in Europe’s motorcycle press. Our list prices are still consistently higher than almost every other country, but the discounts available in the UK are far bigger, which is why we often end up paying less. In France, for instance, the list price of every bike in our survey is lower than the UK, but there’s almost no chance of getting a discount. So why are our discounts so much bigger than the rest of Europe? And why has it taken that to bring our prices more in line with our neighbours? And why, even after getting the biggest discounts, are some countries still paying less? Kawasaki UK’s Martin Lambert thinks the discrepancy between RRPs and real prices in the UK is a result of the nature of this country’s dealer network. He said: " On most products, RRP is only an indication of what customers might pay.
" There are a lot of multiple franchise dealers in the UK who can afford to sell bikes with a low profit margin because they sell so many.
" In other countries, like Germany, the market is dominated by single dealers, who sell in smaller volumes and therefore need a bigger profit margin on each bike. " Only Yamahas buck the general trend. It’s still possible to get an R1 for almost £700 less, or a Fazer 600 for £600 less simply by crossing the Channel. Yamaha UK’s Dan Harris claims this is a result of the extra benefits offered to UK buyers. He said: " We offer subsidised insurance on the R1 and on our scooters, and these offers could save someone a four-figure sum. " He also thinks bigger discounts on list prices in the UK are the result of some manufacturers over-ordering bikes in 2000.
" Some firms were forced to cut wholesale prices on 2000 models in order to clear them, " said Harris. " That was passed on to the customer.
" But the dealers had to focus on shifting 2000 bikes instead of 2001 models last year. I don’t think that’ll happen again. " He still thinks we’ll see both list and real prices continue to become more uniform throughout the EU, though. He said: " We’re working to develop pan-European pricing. Already it’s hardly worth your while importing from the EU.
" You might save a few hundred quid, but it would cost you more than that to do it.
" That trend will continue and we will see the price difference diminishing in future. " Parallel importers rely on discrepancies in European pricing in order to buy bikes from other European countries and sell them at a profit here. And uniform pricing would threaten their business. But Paul Ingram, from the UK’s biggest parallel importer, DK, in Staffs, isn’t concerned yet. He said: " Until something actually happens, it’s impossible to say what the consequences will be.
" But sports bikes will always represent a smaller part of the market in places like Germany than here, and their pricing will reflect that. And if pricing has become more uniform, it’s partly parallel importing which has lead to that – so we’ll always have a part to play in keeping it that way. " It may never be possible to buy the latest sports bike as cheaply here as in Germany. But at least we no longer have pay so much more simply because we like that type of bike. And if the manufacturers are to be believed, in future we’ll pay even less for the privilege. Getting to Europe has never been cheaper!